The Brattleboro Historical Society and the Town Arts Committee invite the public to the Transportation Center from 5:30 to 8:30 p.m. on January 7, during January's Gallery Walk, to view two new murals in the waiting room and meet the artists who painted them. Sponsored by the Brattleboro Town Arts Committee, Steven Donovan was the first muralist to paint the two front interior walls, and after ten months, his landscape scenes disappeared under three coats of paint. Joan Peters has now painted a bold and vibrant quilt image on one of those walls. She was inspired, she said, by "a quilt design that [she] had seen, dating from 1850 and which could have been made here in Vermont. 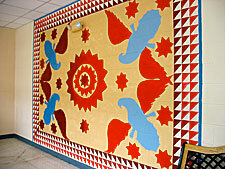 The motif of four eagles with outstretched wings was a common motif from Vermont to Ohio." A color consultant in Brattleboro now, Peters has designed and made quilts since her late teens, moving gradually from traditional to more free-form designs. "It was most important to me to choose a mural design which was integrated into the context of the surrounding brick buildings and which could be seen easily from the street as well as enjoyed by those in the waiting room." Mural painter Terry Sylvester was sponsored and aided in her mural project by the Brattleboro Historical Society. For inspiration, she searched through images of the old Brattleboro train station. She chose one early photograph, she said, "because from that particular vantage point -- up on what might have been Prospect Street -- it included the river and the bridge, and could easily be adapted to the available wall space." Sylvester further explained, "I painted it in a sepia tone to suggest that other time and to help it take a back seat to the changing mural space in the front of the waiting room, which is the primary focus of the room. As she was in the process of painting the wall, she was often asked by Transportation Center patrons, "Hey, where's that?" 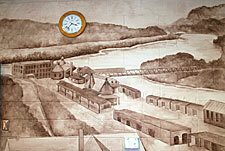 Below the sepia mural sits a large ticket cabinet originally located in the old train station depicted on the wall.